1. Tap on Messages from any Home screen. 2. Tap on the Menu icon in the upper-right corner of the screen. 3. Tap to select Settings from the drop-down menu. 4. Scroll to and tap on Emergency Alerts to continue. 5. To set the types of alerts you want to push to your phone, tap on Emergency alerts. 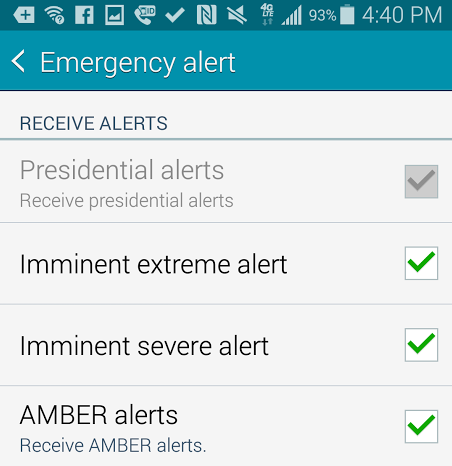 Presidential alerts, including potential terrorist threats and the like, are turned on or enabled automatically and cannot be disabled or turned off.